According to Polish legend, when the head of Krakow’s defensive raftsmen defeated a Tatar marauder in the 13th century, he slipped into the Mongolian’s robes and triumphantly rode into the city. 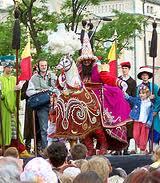 The folkloric myth has been celebrated for more than 200 years with the procession of ‘Lajkonik’ through the Gothic city. Celebrating the Polish defeat of the savage Tarters in 1241 the day is also commemorated by the Hejnaltrumpet call, played every hour on the hour from Market Square church. The tune is rudely interrupted as legend has it that a trumpet player was shot through the throat as he was warning the medieval town of the approaching enemy. The longest party night of the year follows. The terrace bars spill out onto the squares and there is much drinking of the great Polish beer and vodka!